Secret Superstars is our weekly feature where we’ll be highlighting great play from under-the-radar players. I’d be hard-pressed to find a more well-kept secret than New Orleans Saints’ David Onyemata. The 2016 fourth-rounder played in all 16 games for the Saints in Years 1 and 2 of his career, but he didn’t jump off the page as a star contributor. This season, however, has been a different story for the Manitoba alumnus. Onyemata ranks just 26th on the season in overall grade (72.7), but he’s quietly making a climb for a top-10 spot at the defensive interior position. 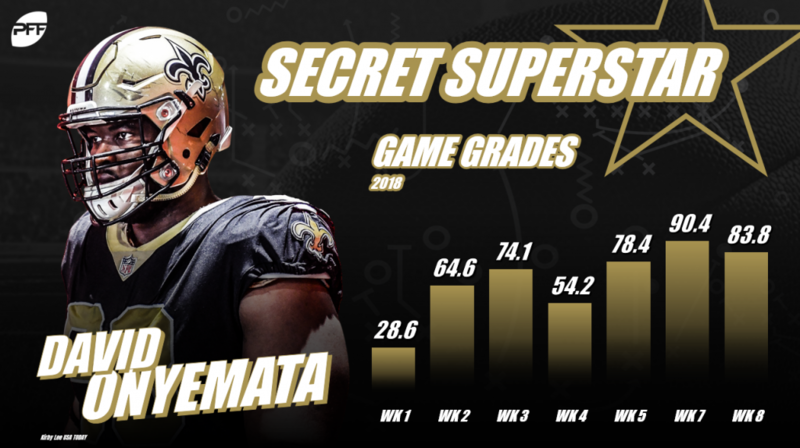 In Weeks 5-8 (three games), Onyemata ranks second only to Los Angeles Rams known superstar defensive interior Aaron Donald in overall grade at 90.6. His 20.3 win rate as a pass-rusher ranks fifth at the position in said span of weeks, as he’s recorded five total pressures and beaten his opposition an additional seven times across his 59 pass-rush snaps in Weeks 5-8. Seattle Seahawks wide receiver David Moore has earned 77.0-plus overall grades in each of the team’s previous three games, including a career-high mark (92.8) in Week 8 against the Detroit Lions. His 91.5 overall grade over the past four weeks (Weeks 5-8) ranks second behind only Minnesota Vikings wide receiver Adam Thielen. Moore has caught nine of his 11 targets, including three contested catches, for 182 yards, four touchdowns and three first downs in his last three games. Also, six of his nine receptions have gone for 15-plus yards, and he leads all 89 wide receivers with at least 10 targets in the last four weeks in yards per route run (4.44). 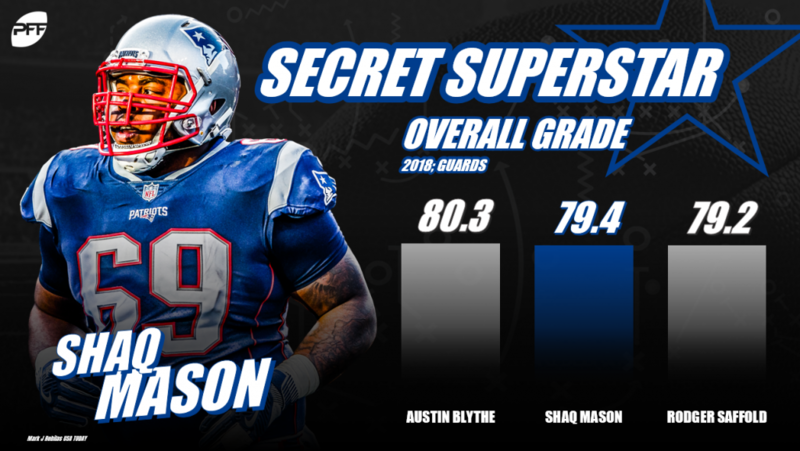 Despite ranking second behind just PFF All-Pro Austin Blythe in overall grade on the season, New England Patriots guard Shaq Mason has still managed to fly under the radar. He’s also turned it over the past four weeks, as he leads all guards with 100-plus offensive snaps in Weeks 5-8 in overall grade (86.5). Where he’s been at his best has been the run game, as Mason also leads all qualifying guards in said span of weeks in run-block grade (84.1). Only one other guard (Marshal Yanda) has a run-block grade above 80.0 in the same four weeks. Robinson is blossoming into one of the league’s top run defenders, as his 90.6 run-defense grade this season ranks sixth among defensive interiors with 150-plus defensive snaps. He is still a few paces off the league’s best as a pass-rusher, but as he continues to refine his craft, he comes closer to being a two-dimensional defender in the NFL. 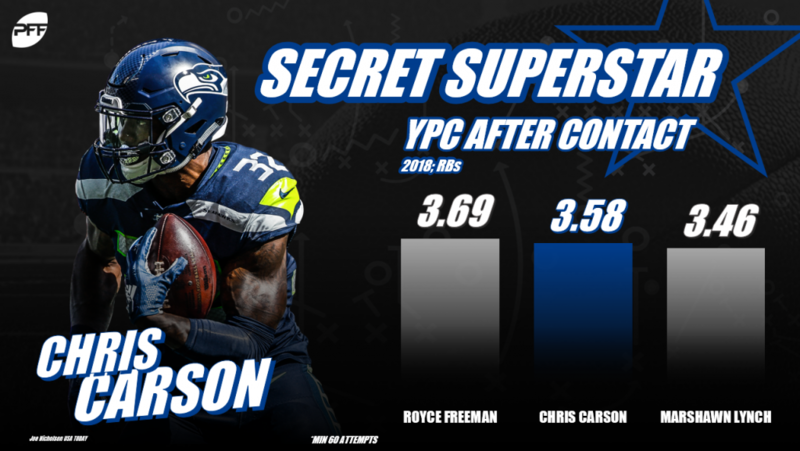 Though Seattle invested a first-round pick in the running back position this season, it’s been their second-year man, Chris Carson, stealing the show. The former seventh-round Oklahoma State product has turned it on as the Seahawks’ lead back in recent weeks, as he’s carried the ball at least 14 times in each of the past for games for the Seahawks and earned game grades above 74.0 in three of the four contests. Among the 46 running backs with at least 25 carries in Weeks 5-8, Carson ranks tied for second in forced missed tackles (15) and tied for seventh in yards after contact per attempt (3.6).